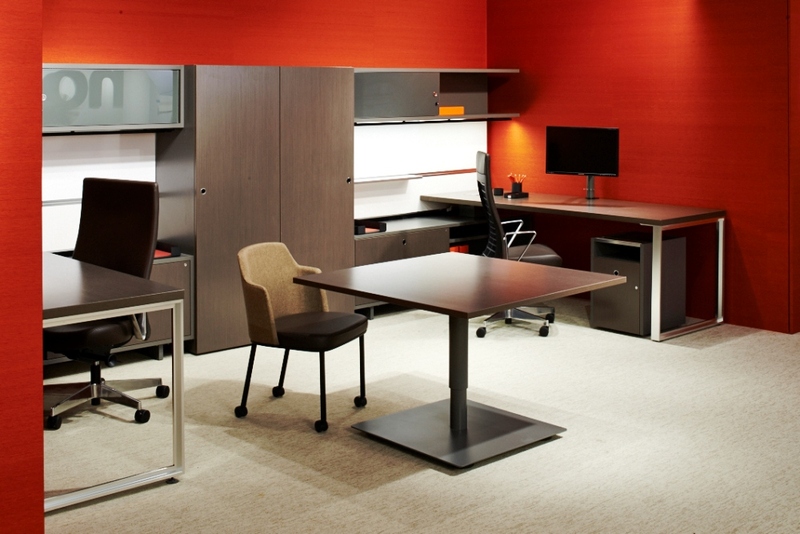 The 21st century workplace poses one constant: ” CHANGE “. 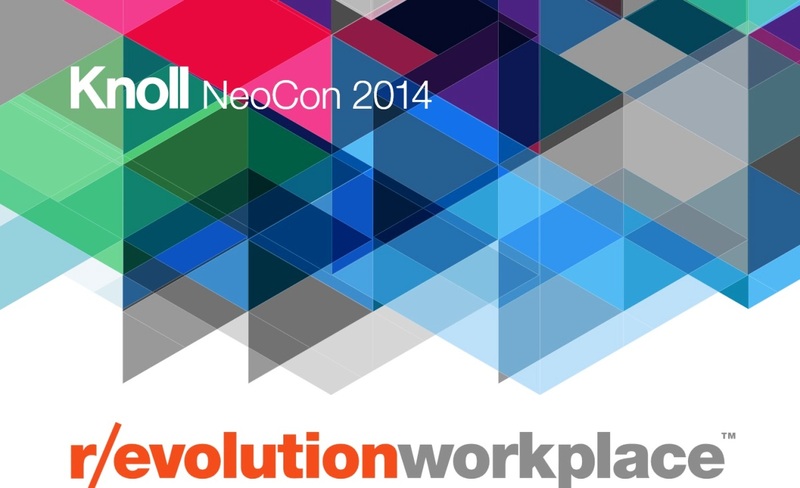 At NeoCon, the contract industry trade show taking place in Chicago, June 9-11, Knoll is presenting ” r/evolution workplace™ ” , a platform that illustrates the freedom and opportunity organizations have to re-imagine the workplace by exploring four distinct interior planning approaches -– Perimeter, Core, Efficient and Adaptive. 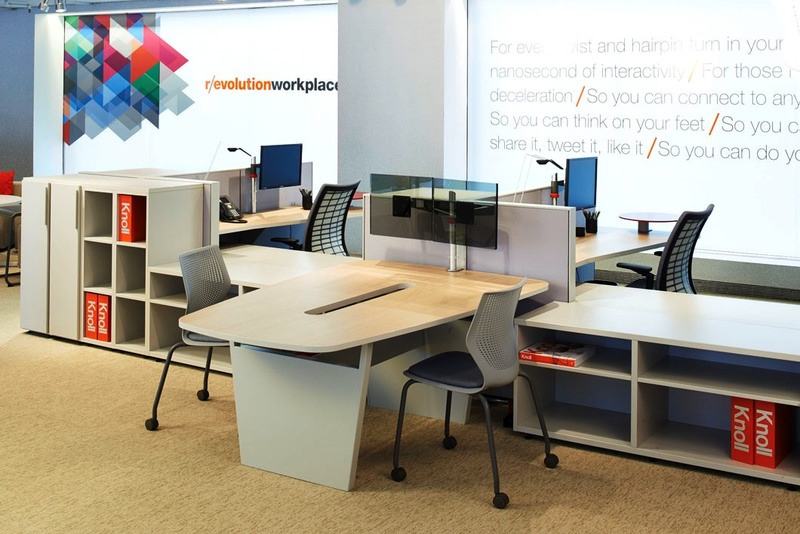 R/evolution workplace embraces the understanding that there is no one “office of the future” and offers planning solutions that address real estate, technology and peoples’ needs differently. 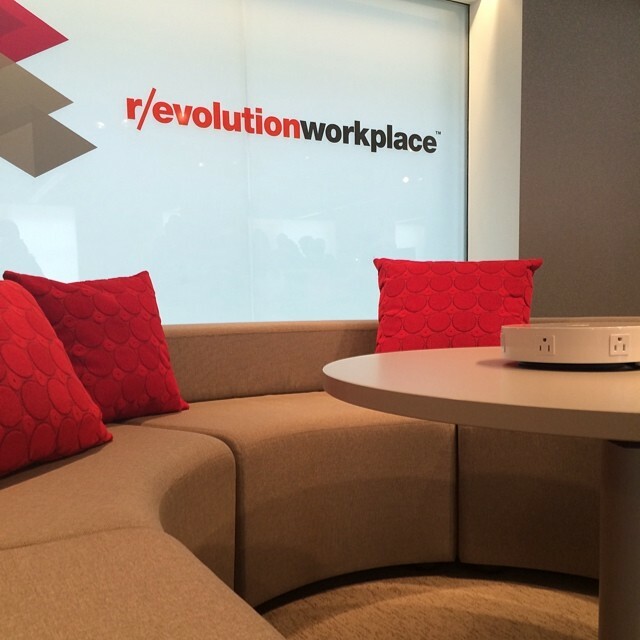 r/evolution workplace is the Knoll perspective on how to move the workplace forward. 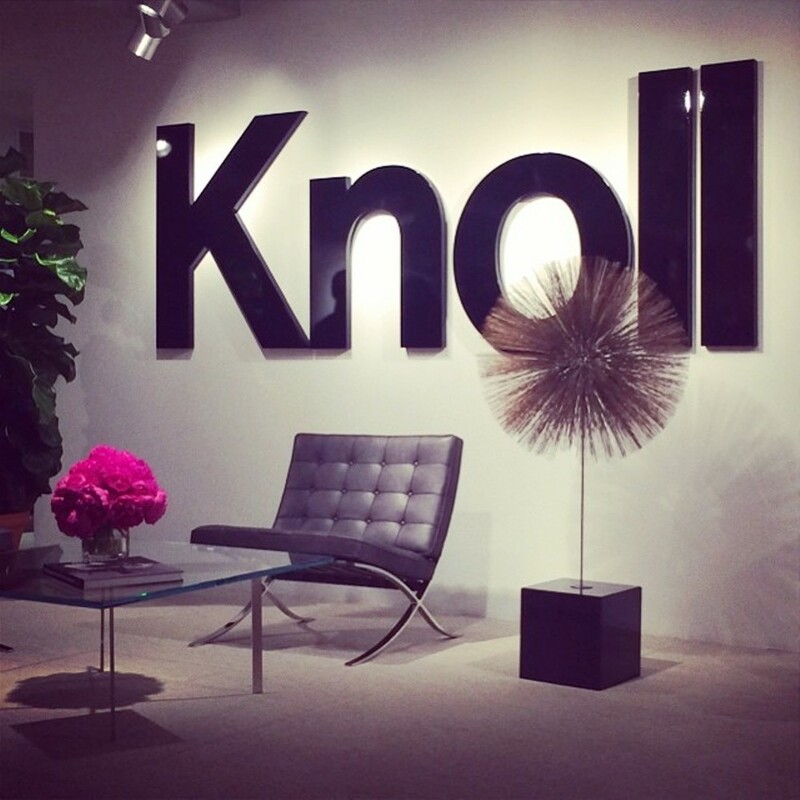 The Knoll Showroom at NeoCon 2014 is on the 1tth floor of the Merchandise Mart in Chicago. 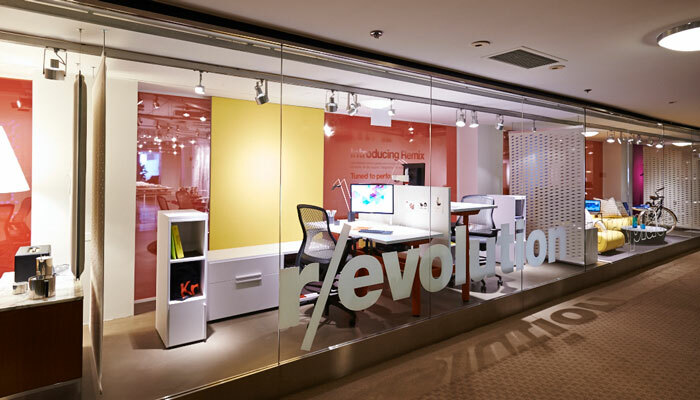 Several new “Best of NeoCon 2014 award-winning designs” that support r/evolution workplace were presented by Knoll including Remix Work Chairs, Antenna Telescope Adjustable Table System and k.lounge Collection. 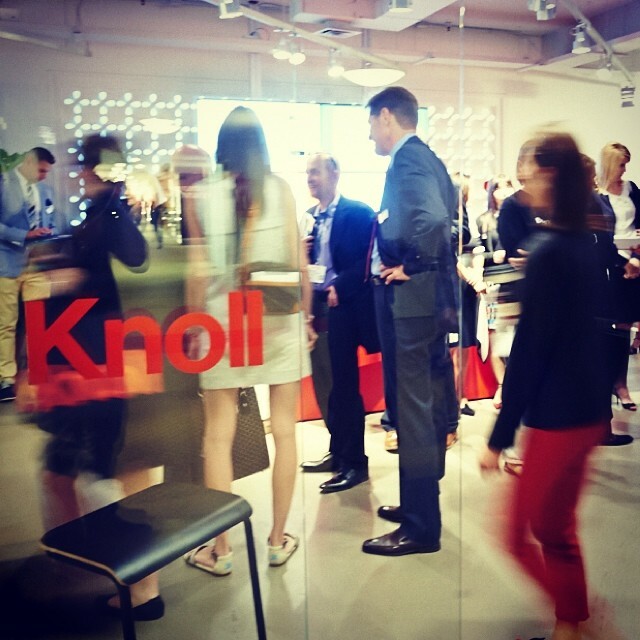 All will incorporate a range of the most popular Knoll products for open plan environments, private offices and Activity Spaces, including the Generation by Knoll® family of work chairs, Antenna Workspaces®, Anchor™, Dividends Horizon®, Reff Profiles™ and Interpole™. 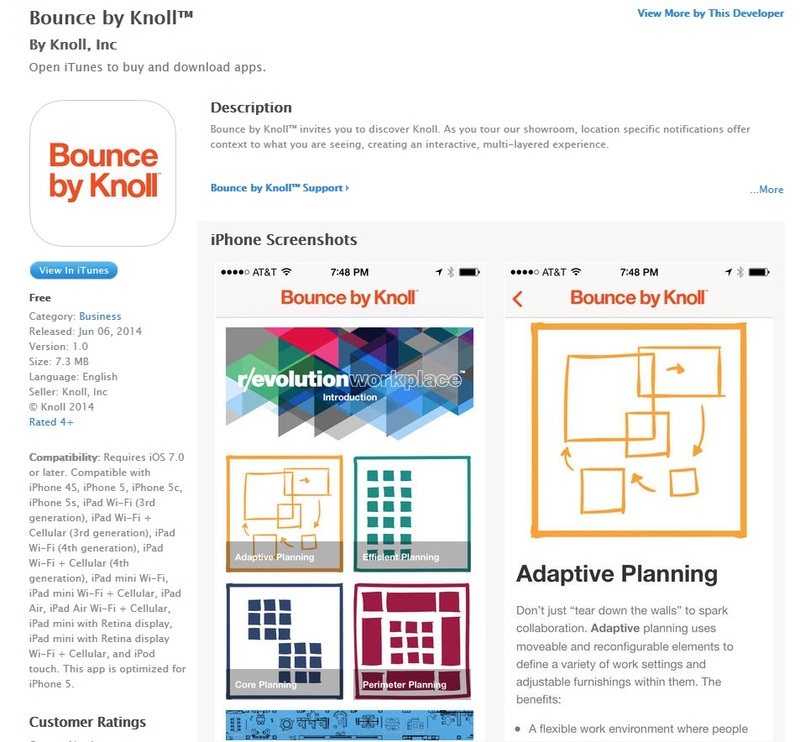 “r/evolution workplace assists clients in moving forward with their workplace planning to create high performance workplaces,” said Andrew Cogan, Knoll CEO. 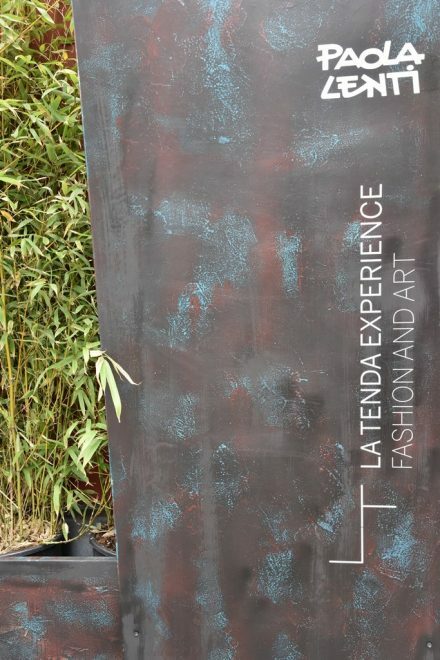 “Remix, Antenna Telescope and k. lounge introductions reinforces our commitment to support today’s diverse work styles,” he added. 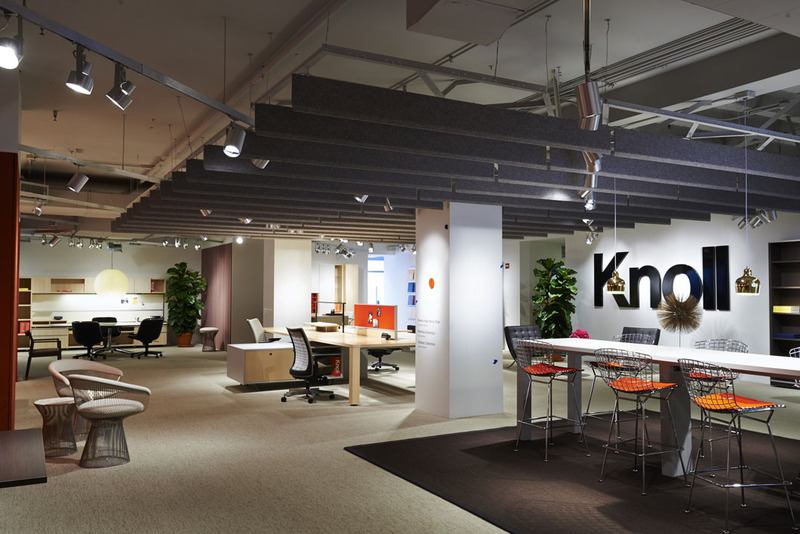 “Our nshowroom has been designed around how our customers think about the workplace, and we look forward to sharing our planning insights synonymous with their business goals,” added Lyn Utter, President and COO, Knoll Office. 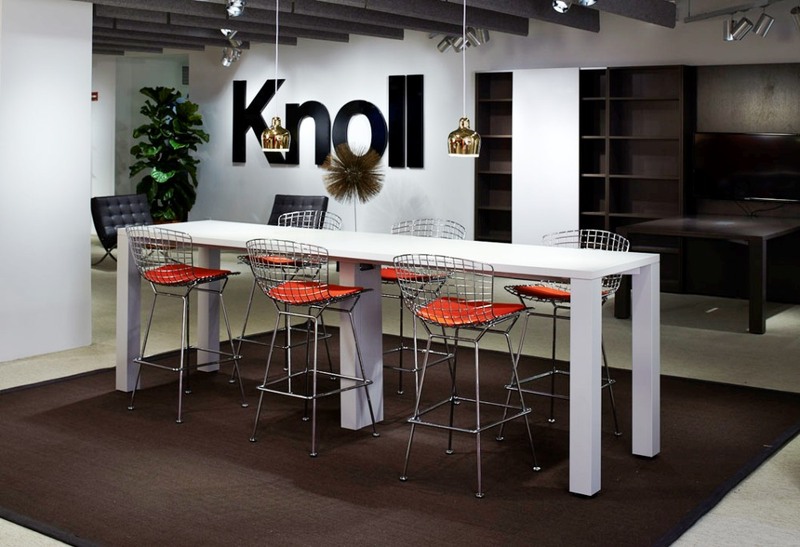 Knoll r/evolution workplace is more than idea. 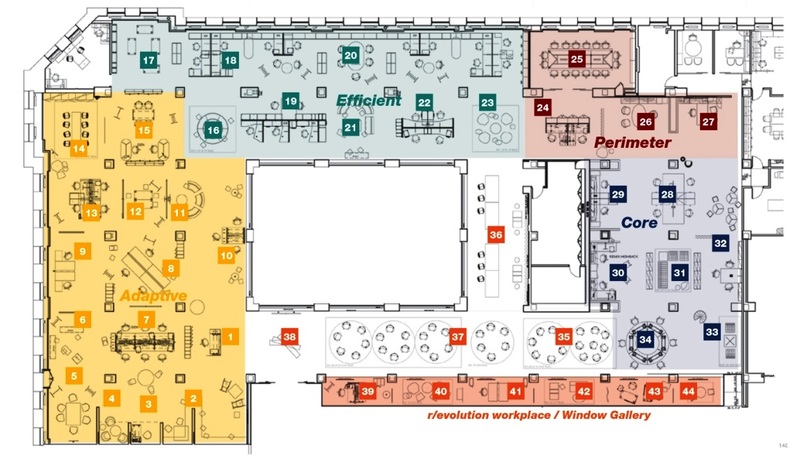 It is a platform that reimagines the office by exploring four distinct interior planning approaches that range from traditional to collaborative. 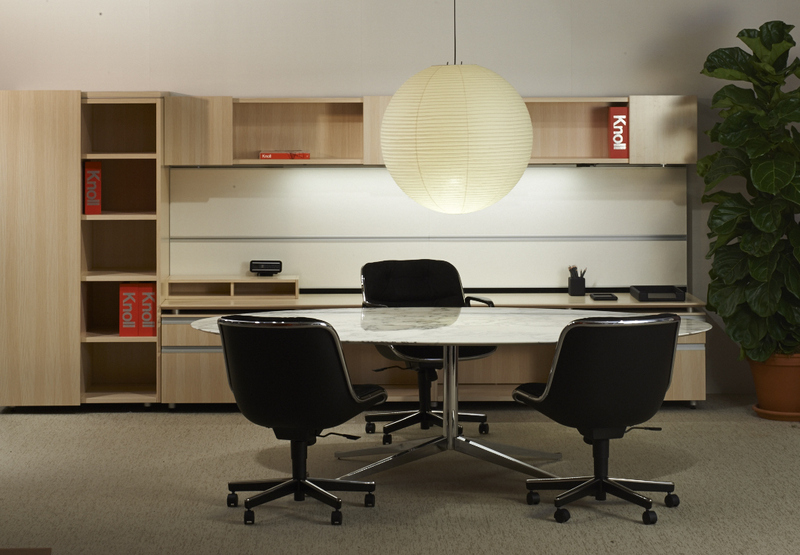 The Knoll 2014 showroom presents new products and introductions within the context of these planning models. 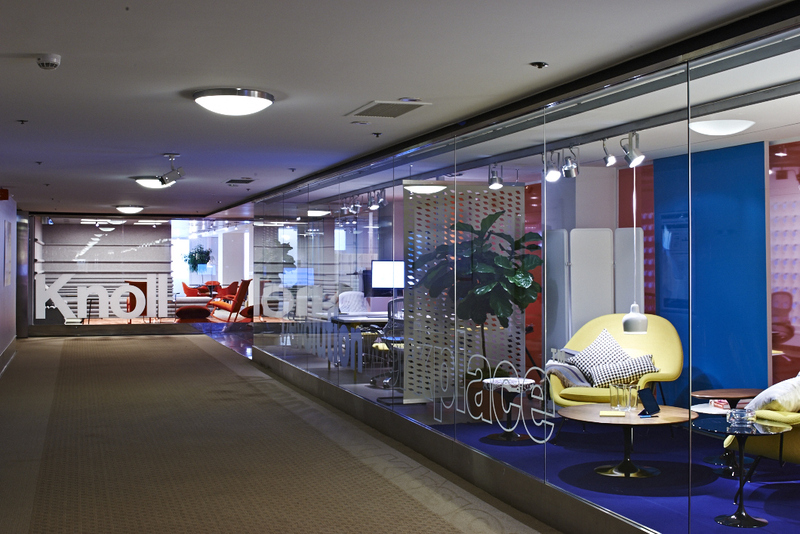 Interwoven throughout the showroom are examples of how each planning approach mixes primary workspaces with Activity Spaces: “go to” spaces accessible to everyone for everything from focused, individual work to social gatherings. 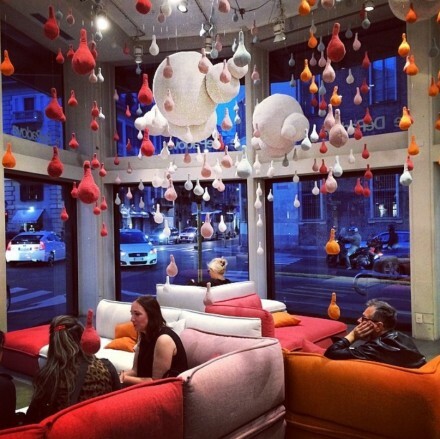 Community spaces that encourage serendipitous interaction, open to all. 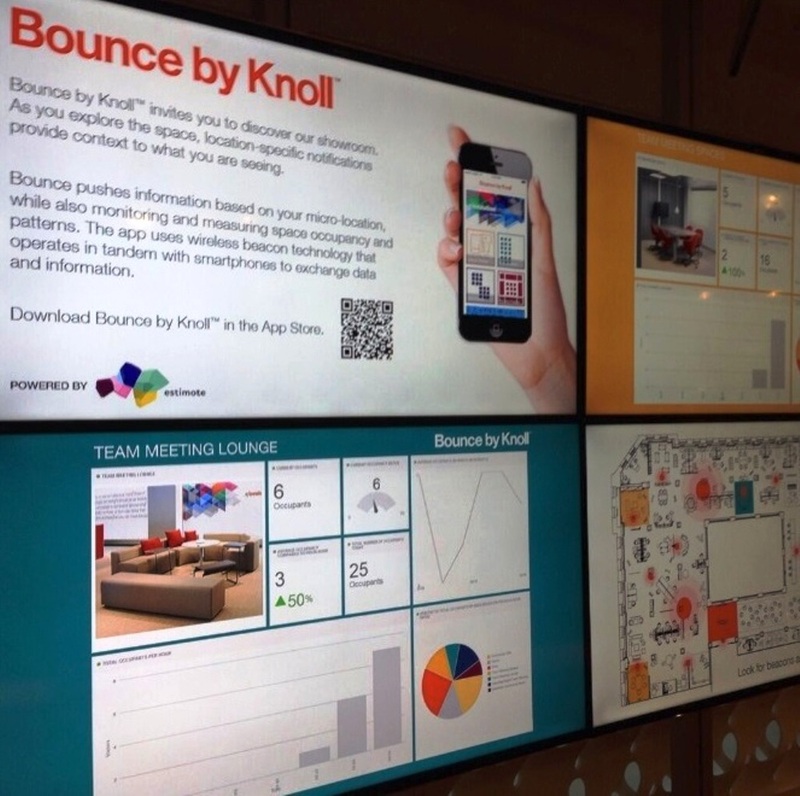 Knoll debuted software developed in partnership with Estimote, a tech start up building a digital platform to bring content and context to people’s current location. 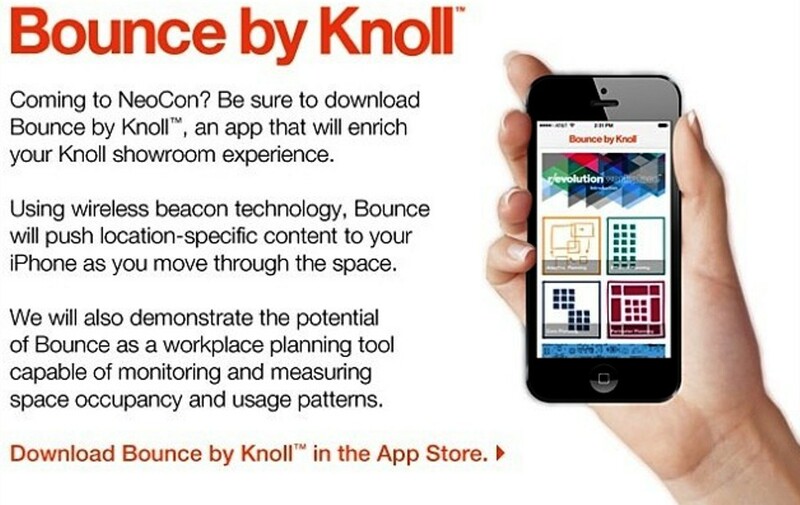 Bounce by Knoll monitors, measures and analyzes space utilization and the work patterns of the office, and offers a digital user engagement platform. 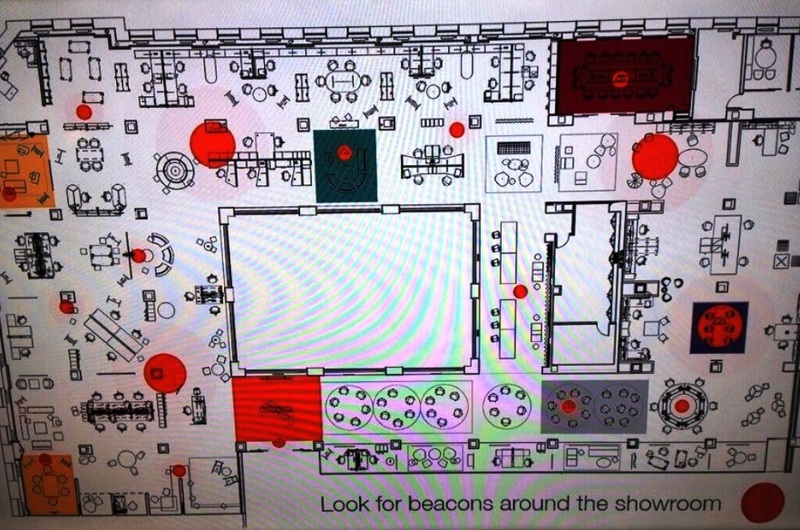 The software uses wireless beacon-driven technology that operates in tandem with smartphones based on a user’s micro-location to exchange data and information. 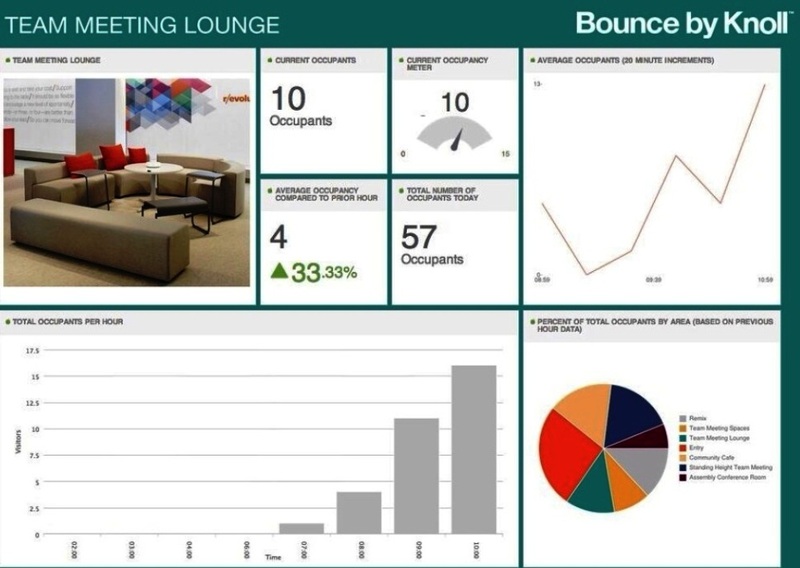 The app will enable real estate, facilities and design professionals to learn from and plan based on space utilization metrics. 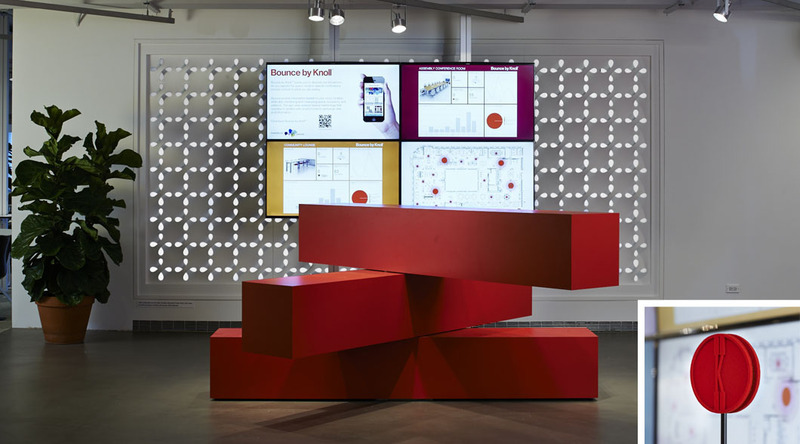 To help guide people through the r/evolution workplace showroom, Knoll employed Bounce by Knoll, a brand new mobile app that will push information to users as they encounter Bluetooth beacons positioned throughout the showroom. 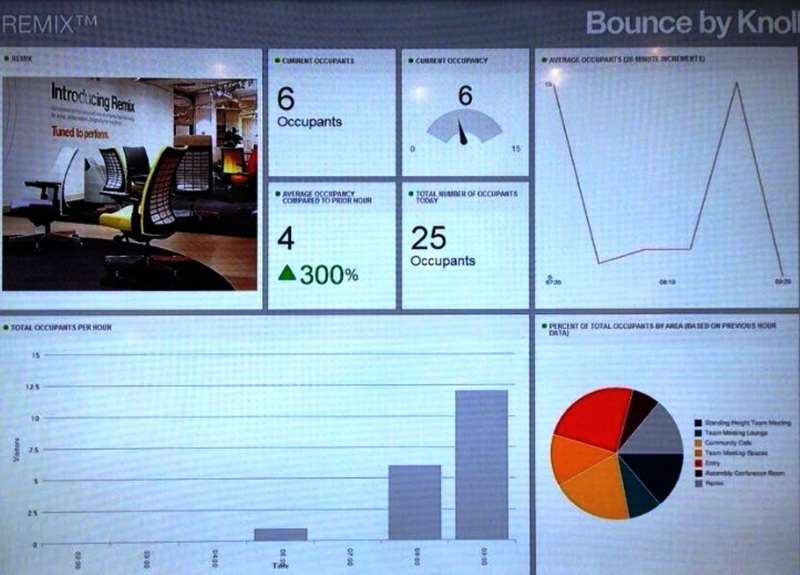 As visitors navigate the Knoll Showroom, Bounce displays product and planning information directly to smartphones. 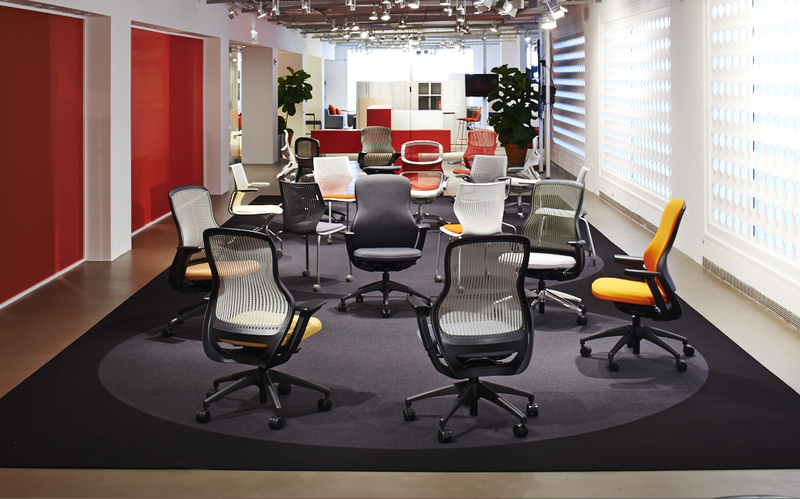 Remix™ is a new collection of chairs by Formway Design, the New Zealand-based studio behind the Generation by Knoll® family of chairs, known for translating key insights from human behavior into intuitive, user-centered, sustainable products. 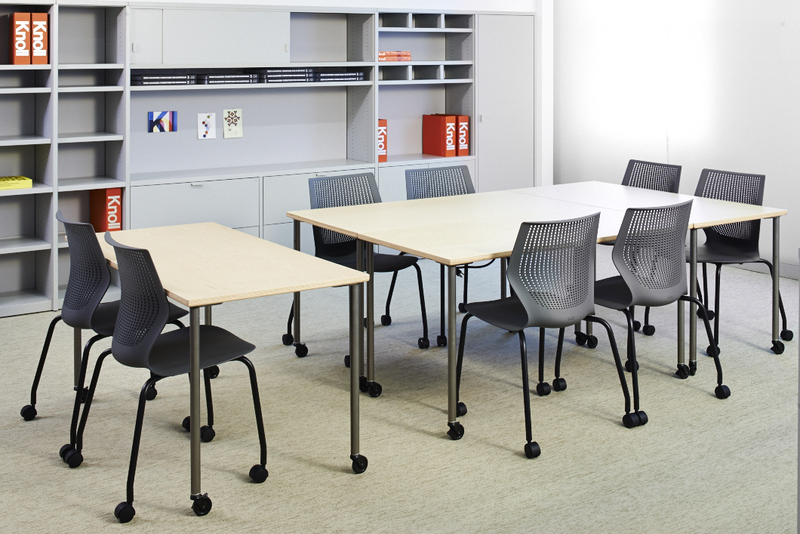 The Remix family includes four seating options – a work chair, a high back chair, a side chair and an activity chair. 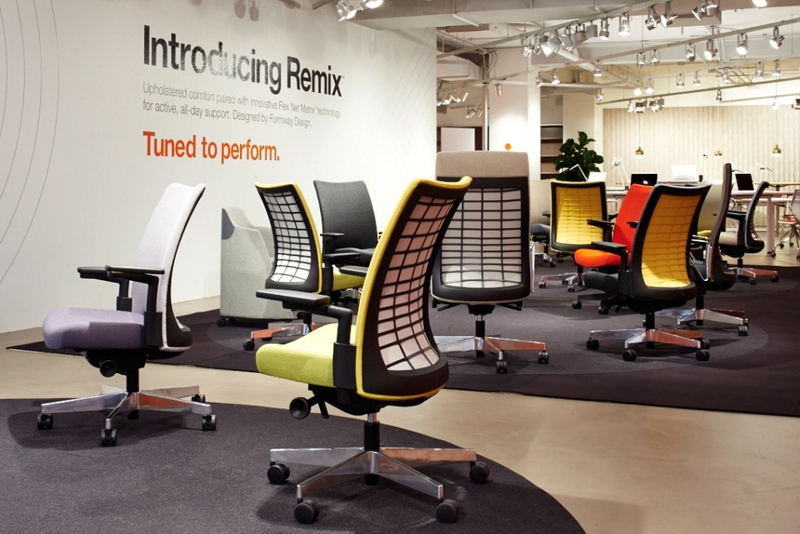 The Remix work and high back chairs combine Flex Net Matrix technology, a specially engineered, high performance elastomer molded to provide resiliency and flexibility, with cushioning to provide movement and cradled support. 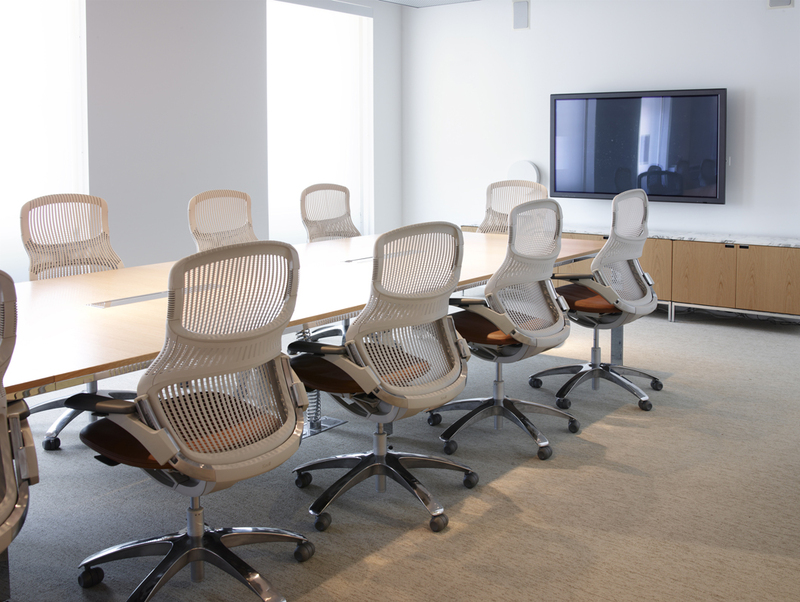 The upholstered Remix side and activity chairs feature integrated flexors which also provide a flexible and supportive back. 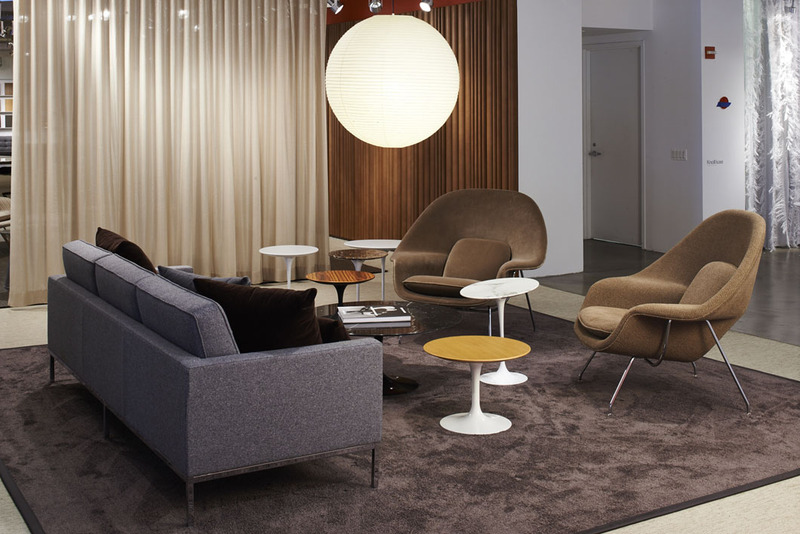 “With Remix, Knoll took a step back and found an unmet need in the market. 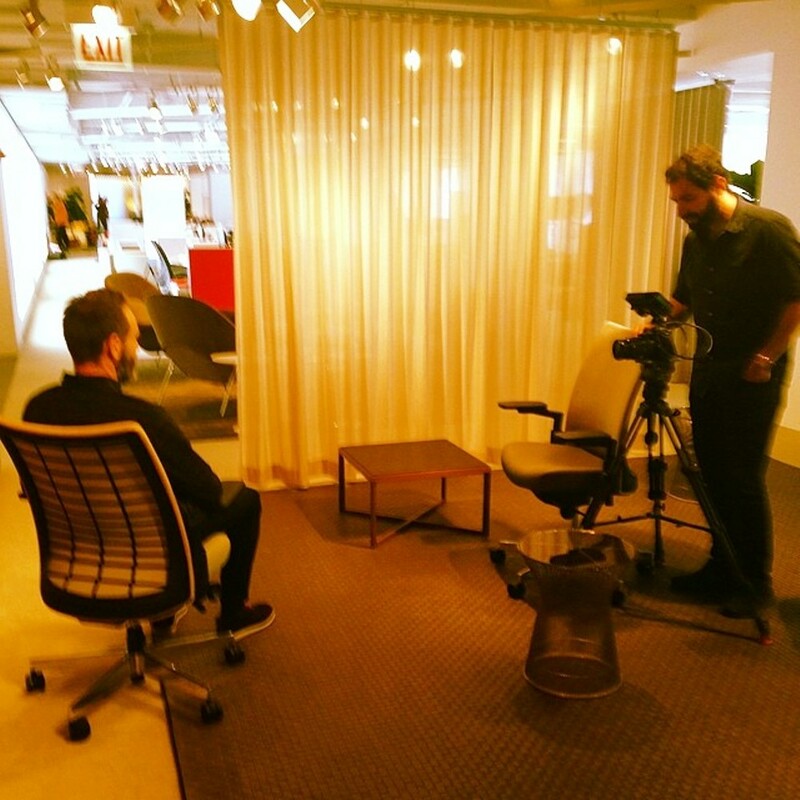 When you look at upholstered task seating, there really isn’t a lot of innovation in this product category,” said Alan Stevens, Knoll senior director of corporate strategy. 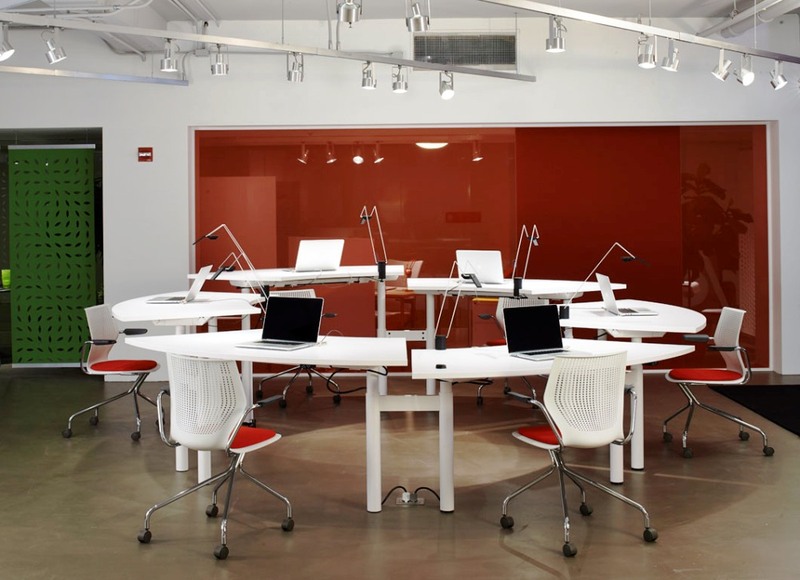 Telescope by Antenna Design is a height adjustable table system that combines the healthful ergonomics of adjustable height work spaces with the planning efficiency of benching. 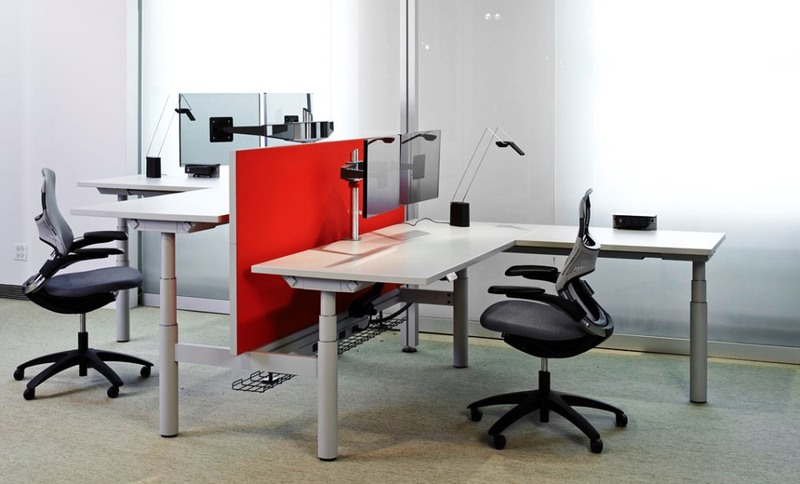 Antenna Telescope desks enable users to independently adjust their work surface from seated height to standing height with a powered or pneumatic control. 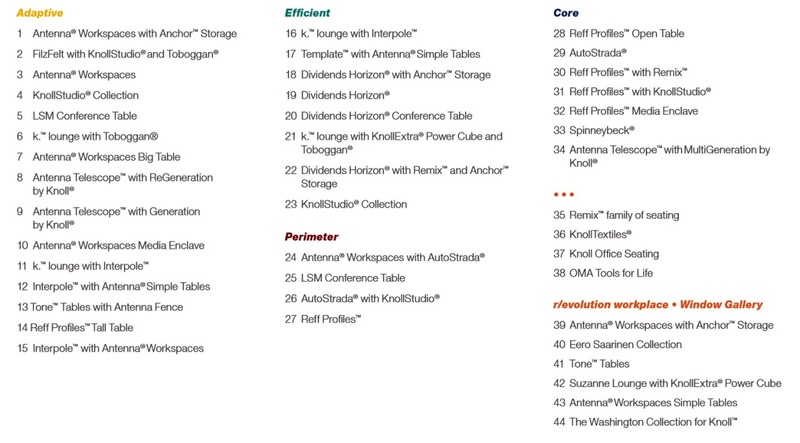 Antenna Telescope offers variable or fixed horizon privacy screens, modular power distribution to the desktop, integrated lighting and monitor support, and comprehensive wire management. 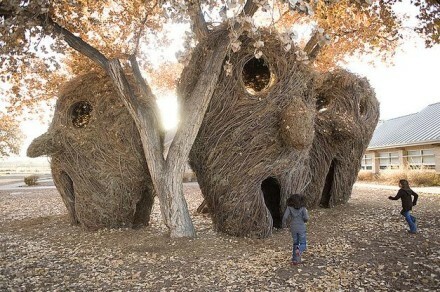 Telescope’s scalability, which allows the system to “grow, shrink and change as customers need,” which will appeal to corporate and higher education customers. 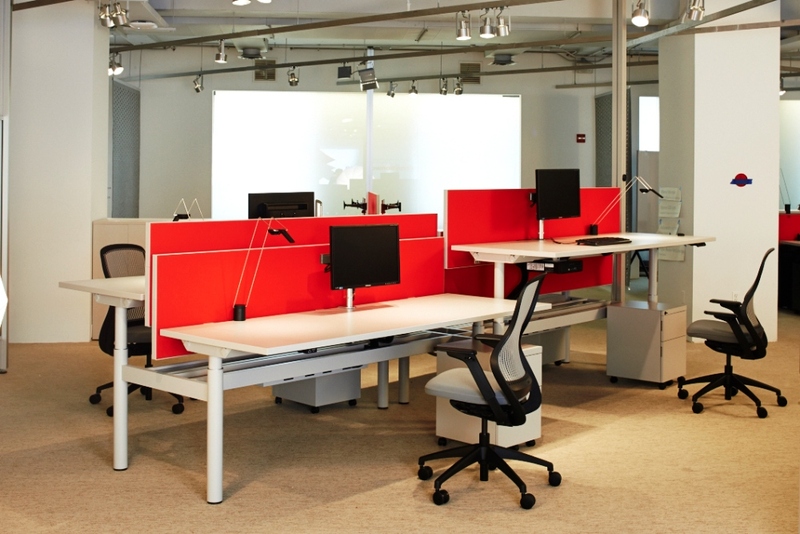 Tone™ Height Adjustable Tables is a new freestanding, height-adjustable table that supports a healthier and more productive work environment. 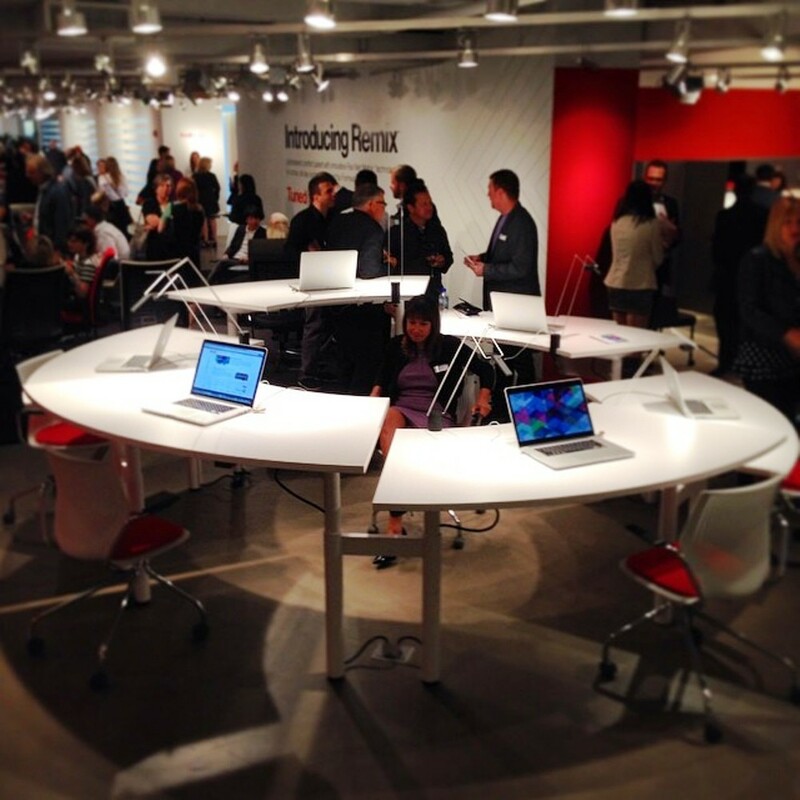 Simple Tables are a new line of tables that roll, link and adjust to help create dynamic, adaptive spaces. 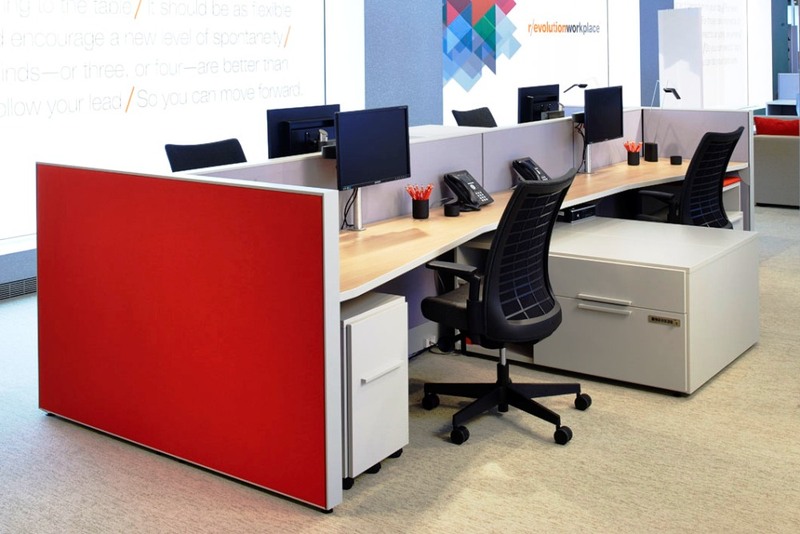 Ideal for the Efficient Workplace, new Dividends Horizons® Worksurfaces and Tables help you re-imagine primary workstations and Activity Spaces alike. 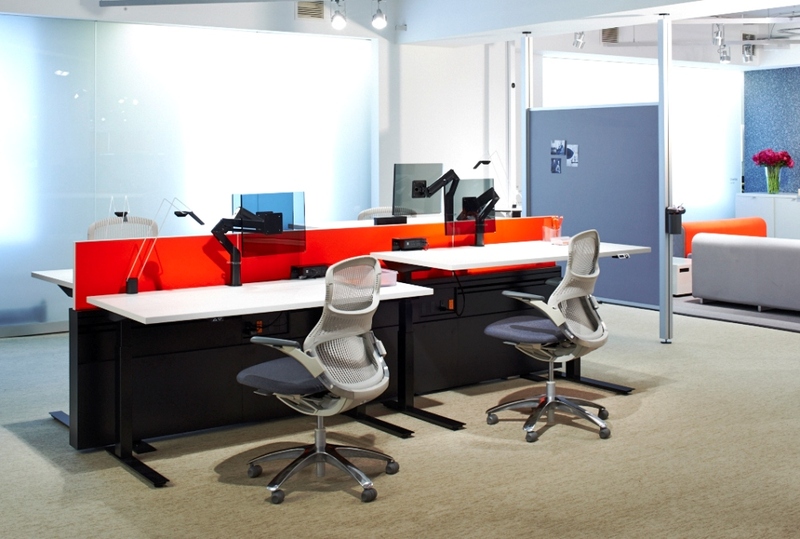 Faceted Worksurfaces feature an outward facing design, positioning the user toward the aisle to support collaboration, while maintaining privacy and a spacious feel for the occupant. 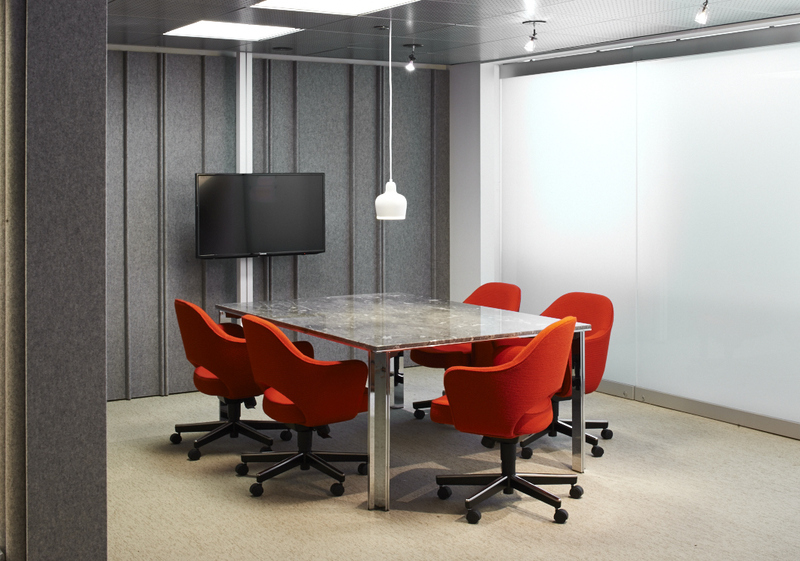 Satellite Surfaces support collaboration in the workstation and technology in the conference space. 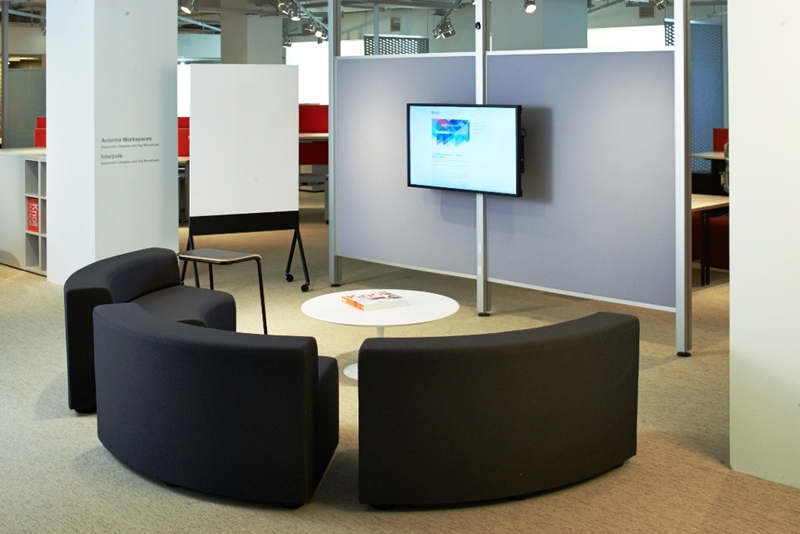 Media Table supports video conferencing with a tapered worksurface shape that angles each user inward, toward the screen. 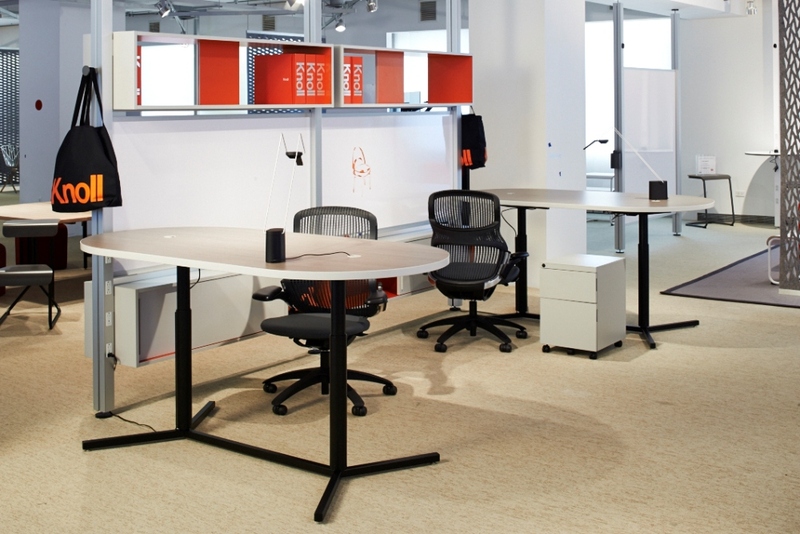 Conference Tables and Bases combine smooth contours with intelligent features like a central wire management access that helps manage technology on the worksurface. 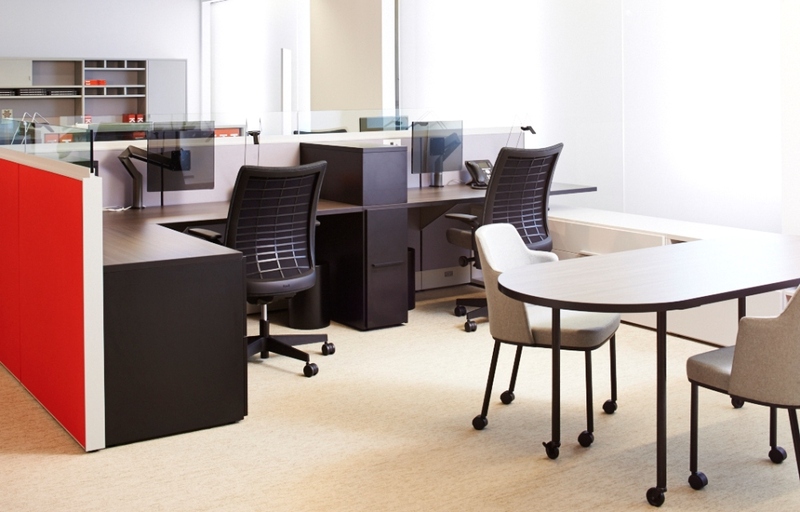 Unique base shapes maximize knee space for as many as eight users while the Pivot-lined stretcher organizes the cables from above. 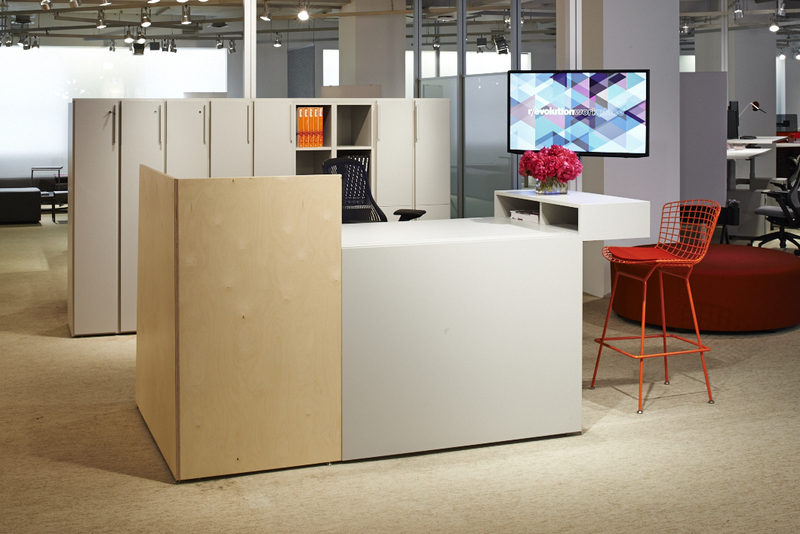 Designed and constructed to showcase wood finishes, Reff Profiles components solve for the modern private office, administrative support areas, open plan and Activity Spaces. 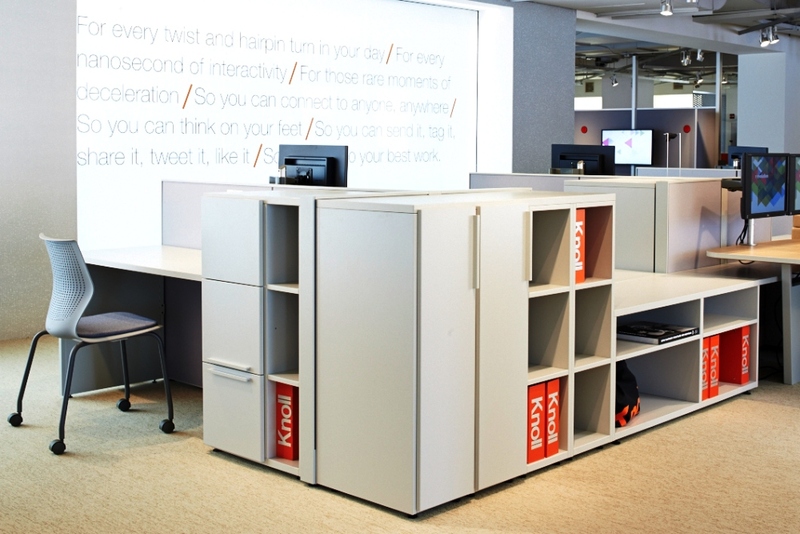 Rethinking how storage is used in the work place, Anchor explores modernized configurations that are evolved to support today’s storage needs, while remaining concious of a compact footprint. 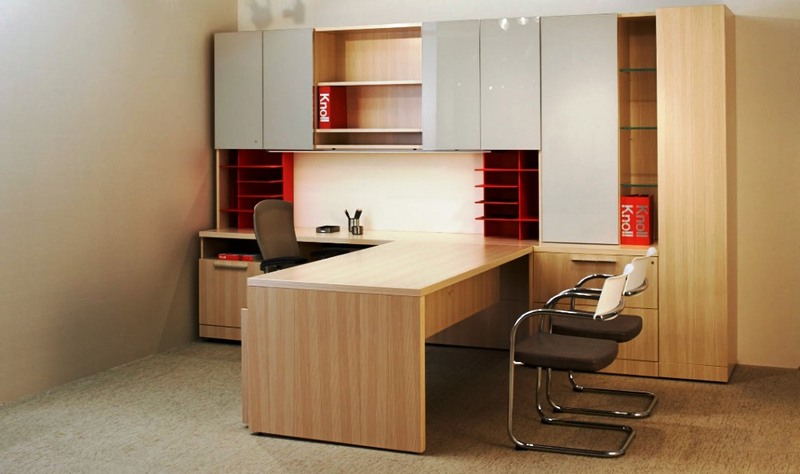 The wood constructed laminate collection contains a broad scope of products that are designed to provide storage for personal and professional items within the workplace as well as support individual storage in group settings. 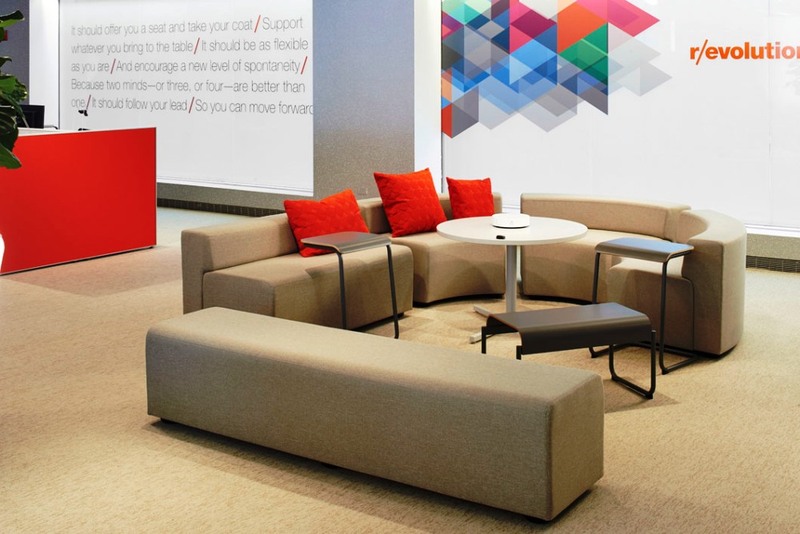 Designed to enhance Knoll systems for open office, Anchor’s mix and match approach allows clients to create blended solutions, tailored to their specific requirements. 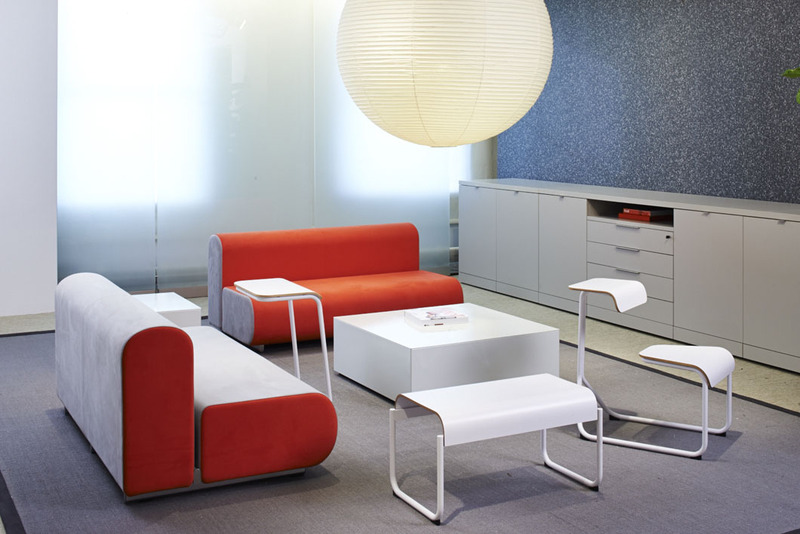 k.™ lounge is a modular soft-seating series from Knoll with 11 configurable lounge elements that bridge the gap between object-based furniture and a plannable system. 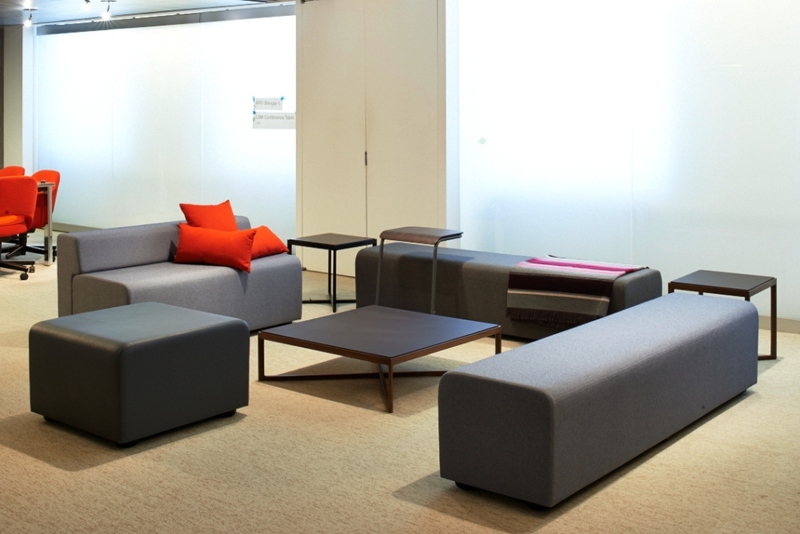 k. lounge pieces can both stand on their own for free placement in a wide range of open or enclosed Activity Spaces and be configured together in myriad ways to define work/lounge spaces within open plan workspaces. 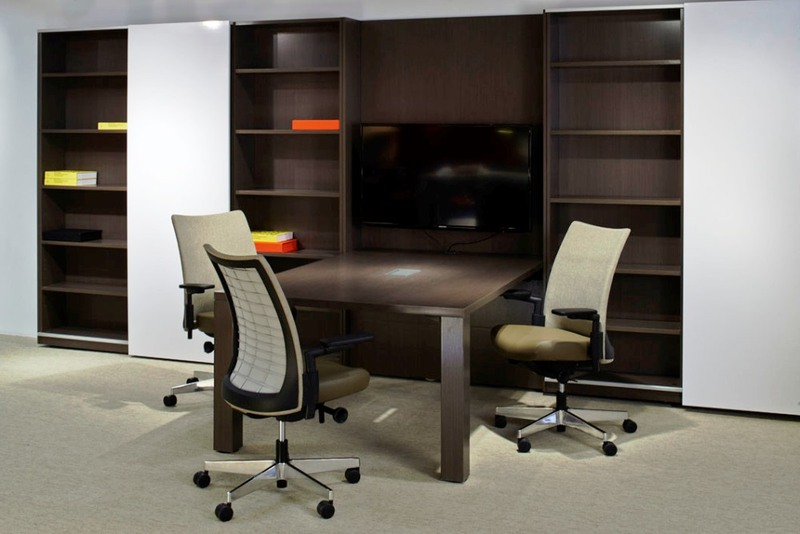 With a contemporary aesthetic and approachable price points, k. lounge is lounge furniture for every organization–small business, corporate environments, healthcare and higher education. 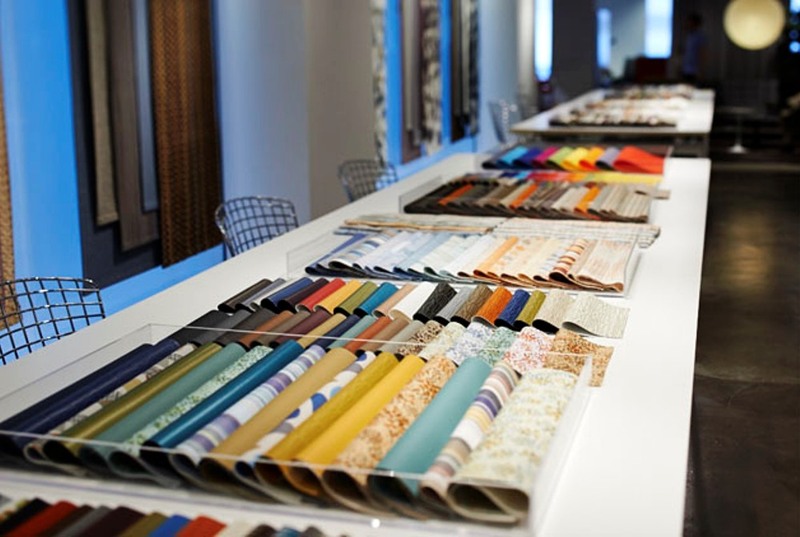 New designs from KnollTextiles, including collections by Kari Pei and Dorothy Cosonas, and five upholstery fabrics that comprise the 2014 Archival Collection, inspired by the work of legendary Knoll designers Astride Sampe, Florence Knoll and Marianne Strengell. 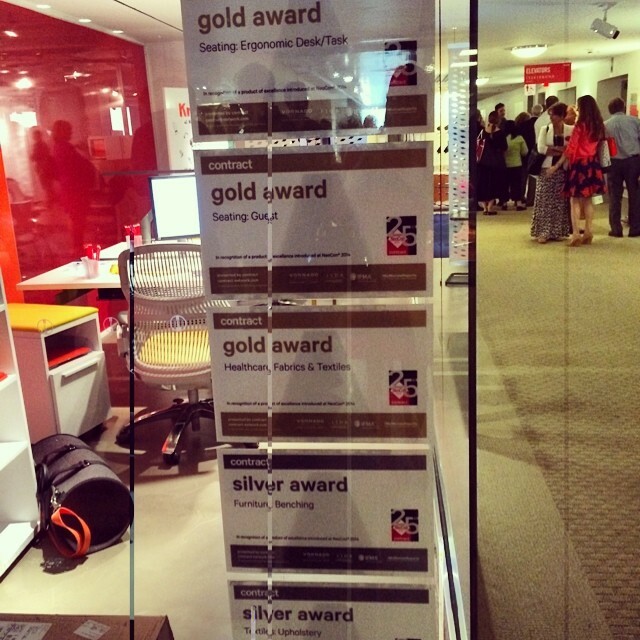 Spirit Collection awarded Best of NeoCon Gold in the Healthcare Fabrics and Textiles category. 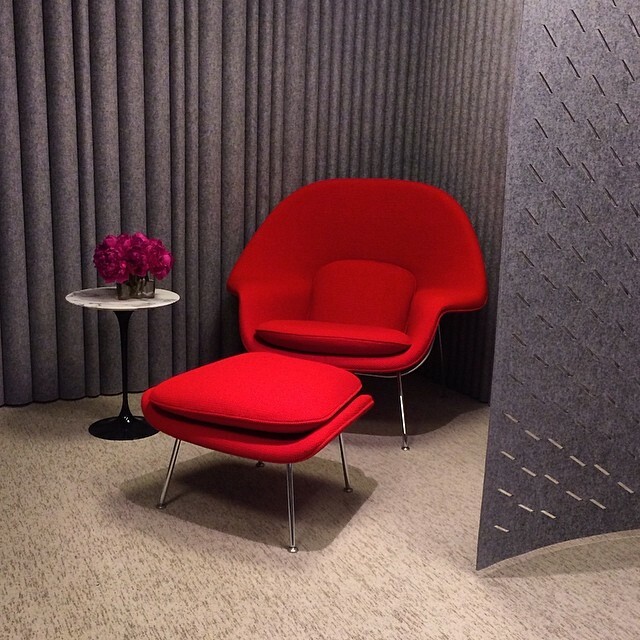 Archival Collection awarded Best of NeoCon Silver in the Upholstery category. 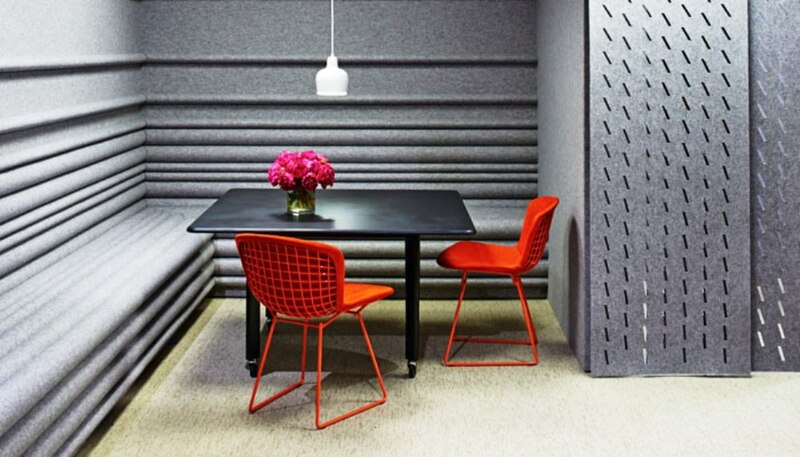 As workplaces become more open, enable multiple work styles and foster collaboration, controlling sound and minimizing distractions becomes essential. 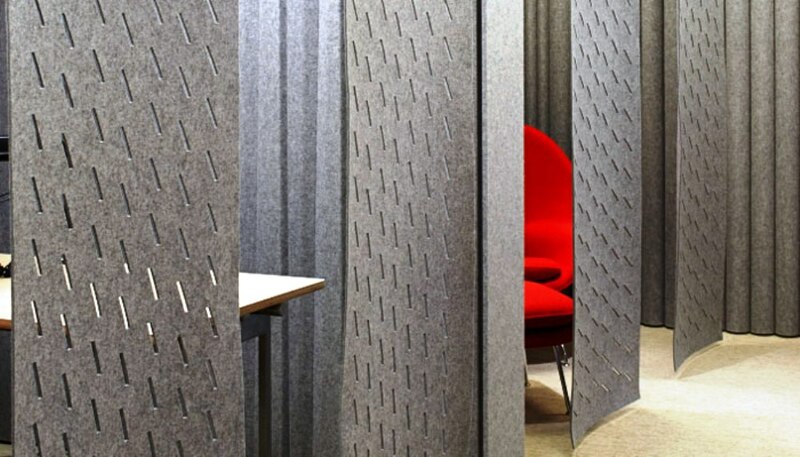 The new Acoustic FilzFelt collection by Architecture Research Office includes wall, ceiling, and space dividing products that allow for acoustic, aesthetic and privacy by combining standard components covered in 63 colors of wool felt. 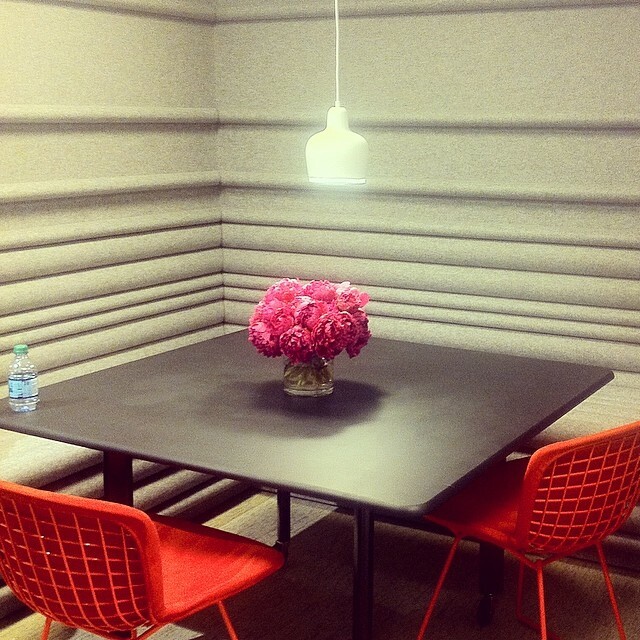 The Erwin Hauer Collection of leather-wrapped modular wall planks by Spinneybeck®. 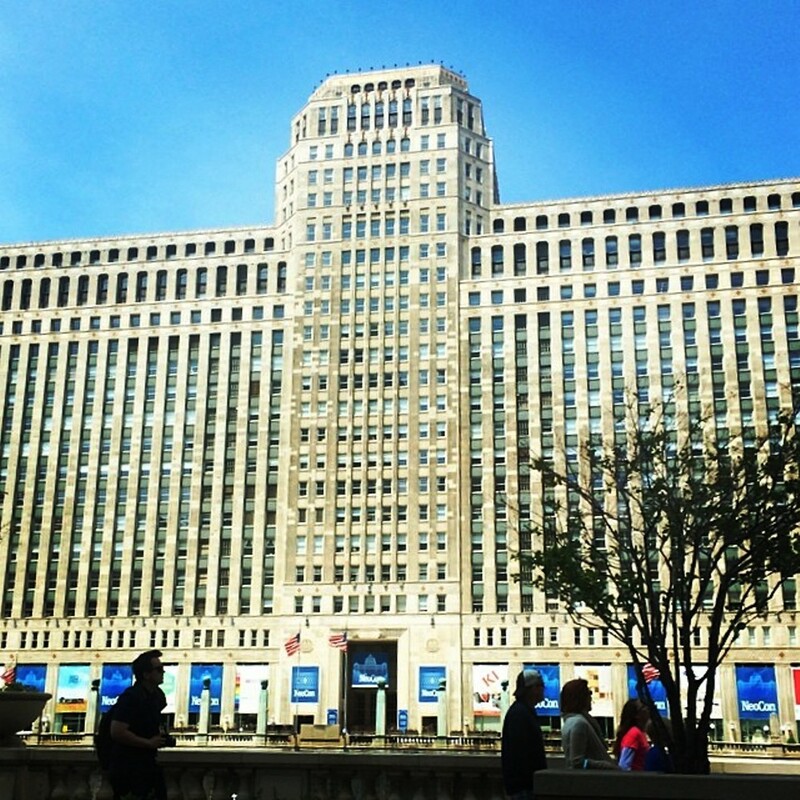 Best of NeoCon honors new products introduced at NeoCon and presented at the Merchandise Mart in Chicago. 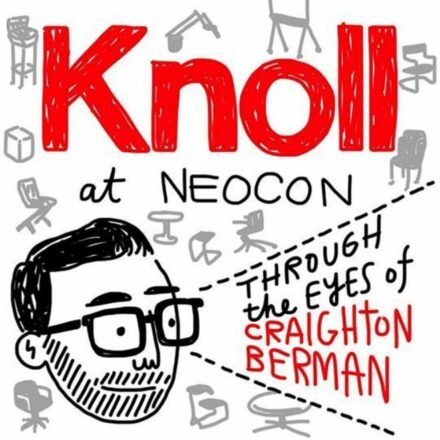 Knoll is the recipient of five 2014 Best of NeoCon awards from Contract Magazine. 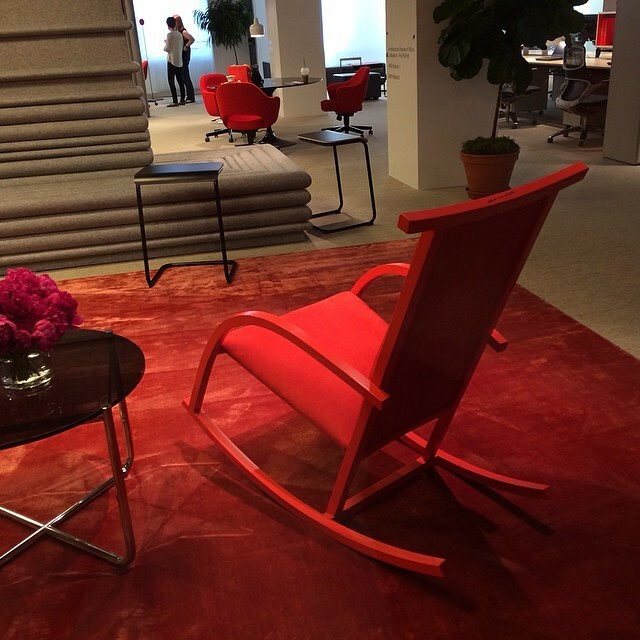 Honorees include the Remix Work Chair, Antenna Telescope and the Washington Collection for Knoll, as well as the Spirit Collection and the Archival Collection for KnollTextiles. 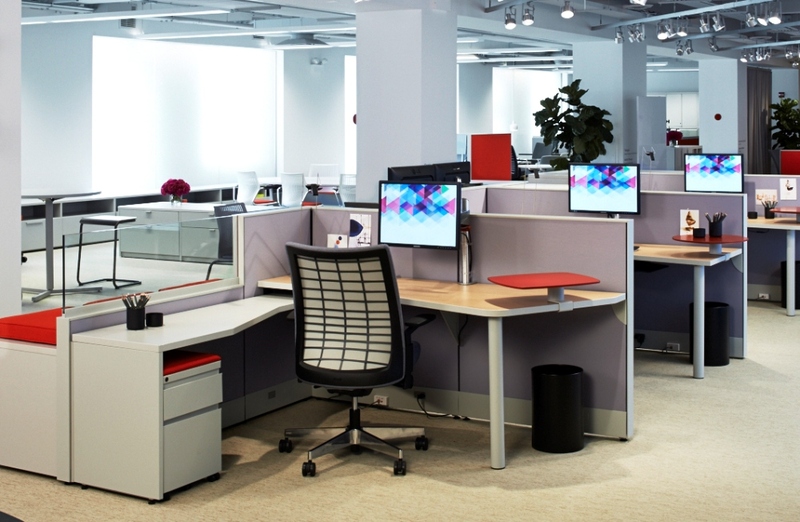 The range of new products and enhancements to existing product lines underscores the Company’s ongoing commitment to achieving BIFMA Level® 3 sustainable design certifications for its open plan, private office, seating and filing product lines. 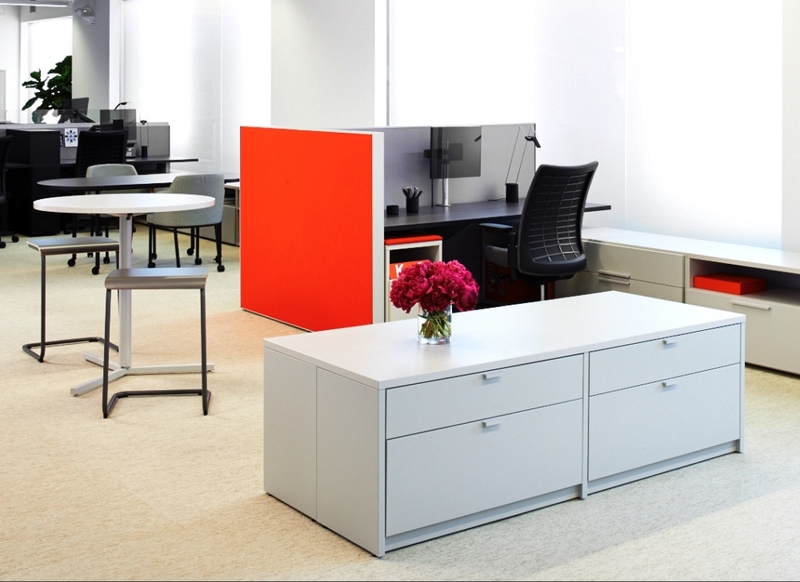 Level® 3 is the highest rating a product can achieve under the Business and Institutional Furniture Manufacturer’s Association’s (BIFMA) level® furniture sustainability certification. 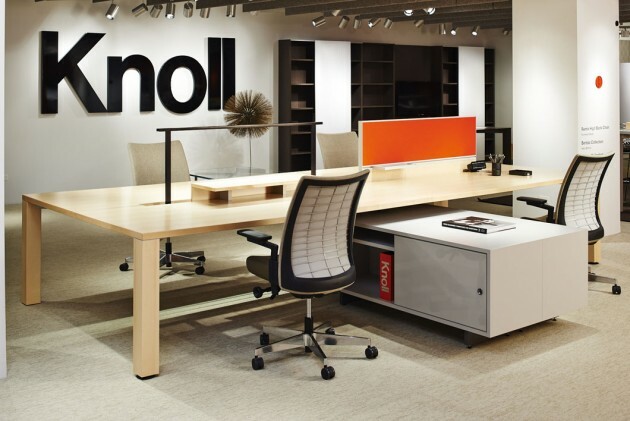 Knoll has been awarded level 3® certifications for 21 of its products. Knoll is recognized internationally for workplace and residential design that inspires, evolves and endures. 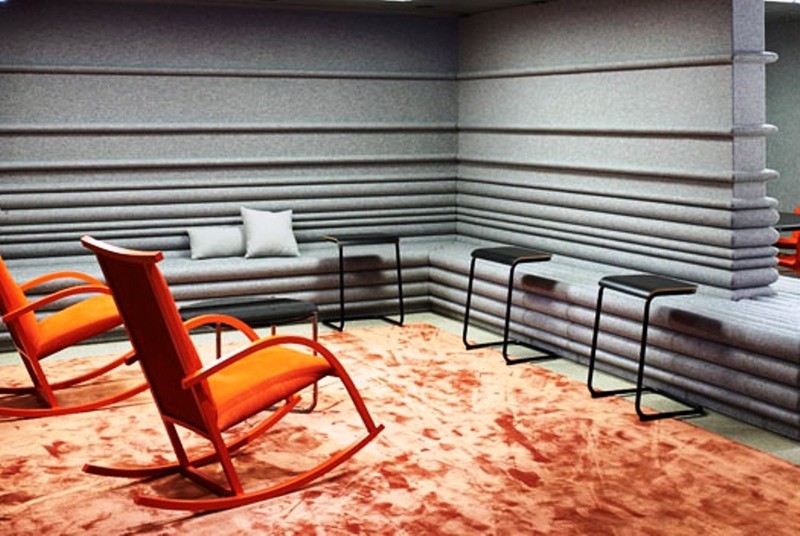 Our portfolio of furniture, textile, leather and accessories brands—including Knoll, KnollStudio, KnollTextiles, KnollExtra, Spinneybeck, FilzFelt, Edelman Leather, and HOLLY HUNT—reflects our commitment to modern design that meets the diverse requirements of high performance offices and luxury interiors. 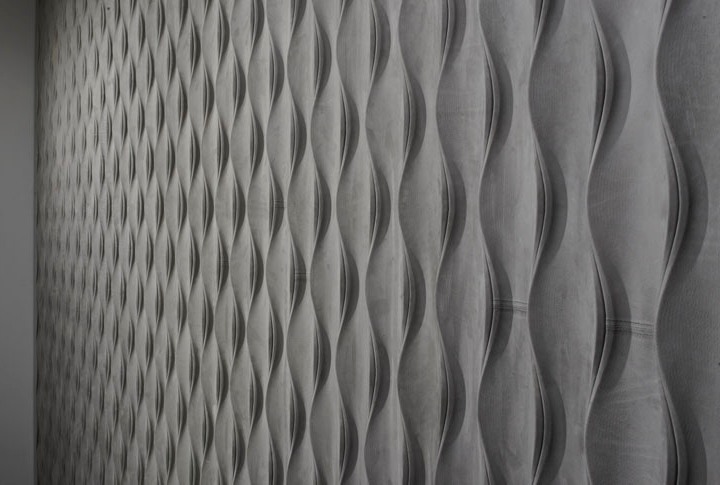 A recipient of the National Design Award for Corporate and Institutional Achievement from the Smithsonian’s Cooper-Hewitt, National Design Museum, Knoll is aligned with the U.S. Green Building Council and the Canadian Green Building Council and can help organizations achieve Leadership in Energy and Environmental Design (LEED) workplace certification. 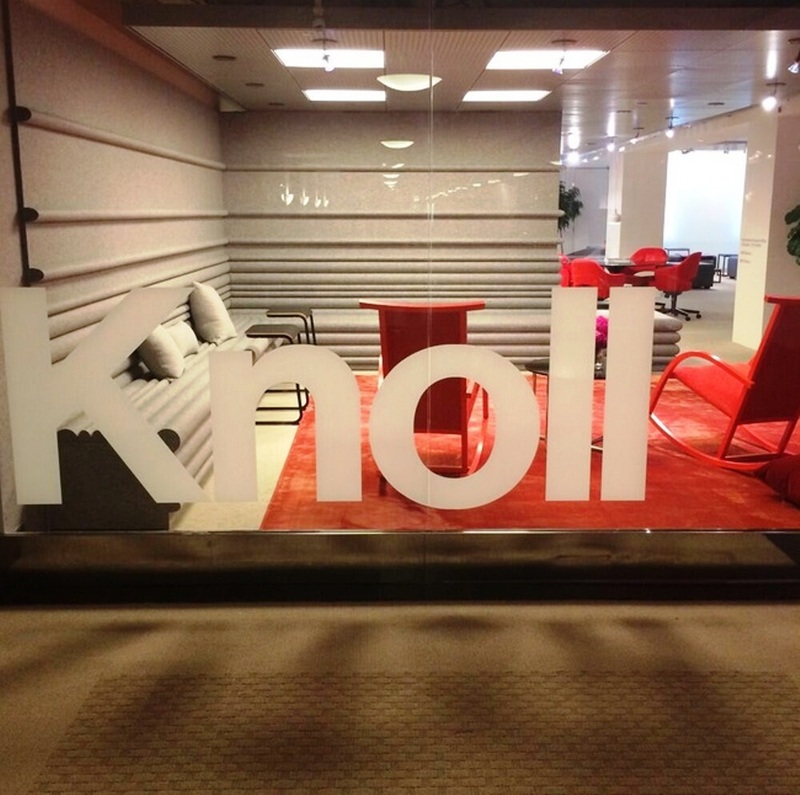 Knoll is the founding sponsor of the World Monuments Fund Modernism at Risk program. 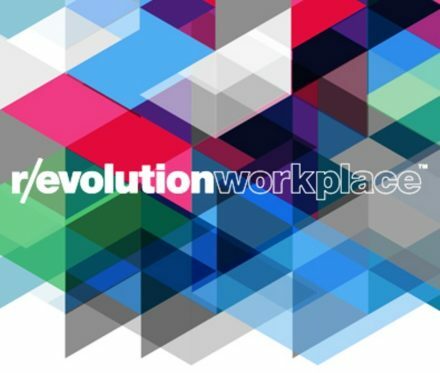 The pace and nature of work are changing at an energetic clip—driven by warp-speed technology innovations, a competitive economy and a diverse workforce with new expectations about the ecosystem of work. 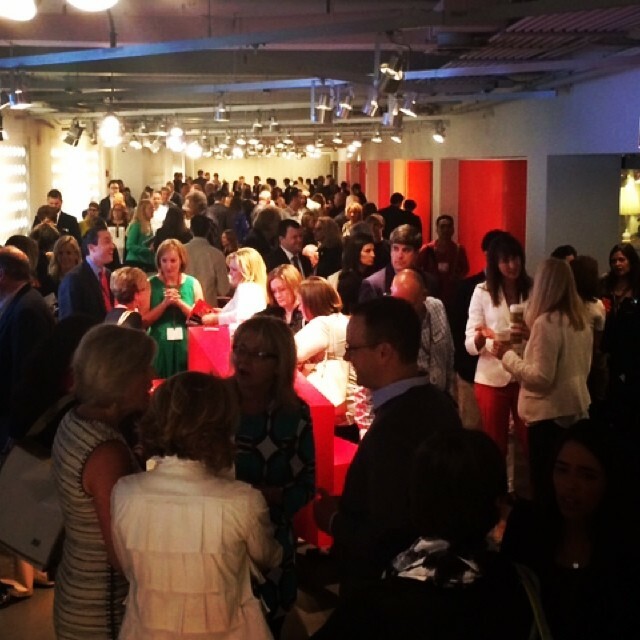 The workplace is a powerful tool that can help organizations compete for talent, engage their people, realize new ways to innovate and increase speed-to-market. 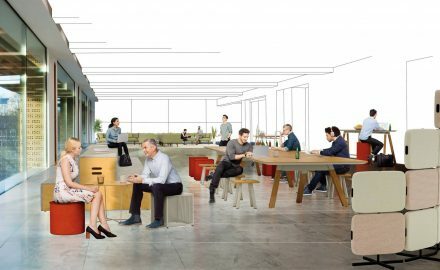 While solving for the modern workplace is complex, there is now an exciting level of freedom and opportunity to re-imagine what the workplace can do. 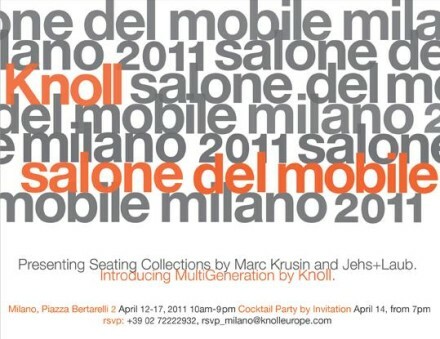 That’s where Knoll’s r/evolution workplace™ comes in. 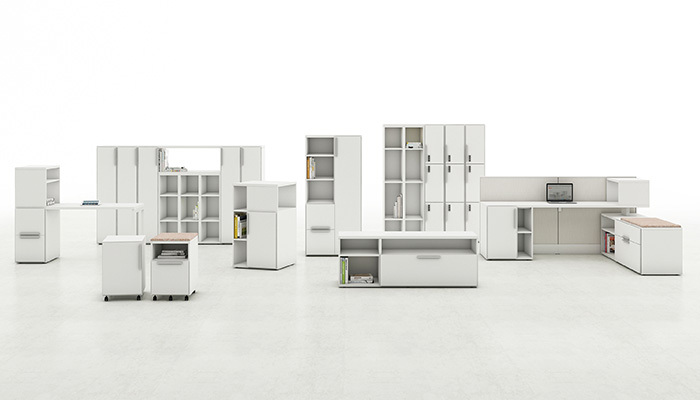 Knoll offers numerous solutions for appropriately scaled activity spaces, offering refuge for one or two, enclaves for three or four, team meeting spaces for five to eight members of a team, and larger assembly and community spaces. 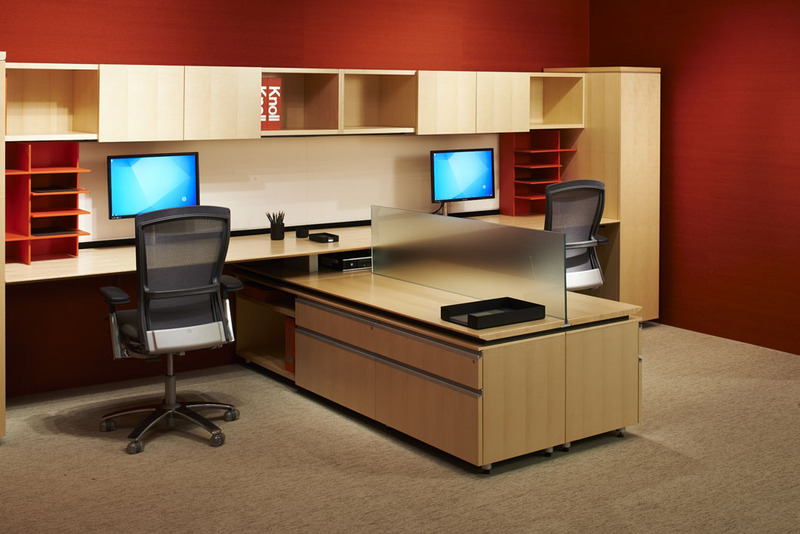 All encourage collaboration, improve workplace efficiency and productivity, and provide organizations the opportunity to express their culture and brand. 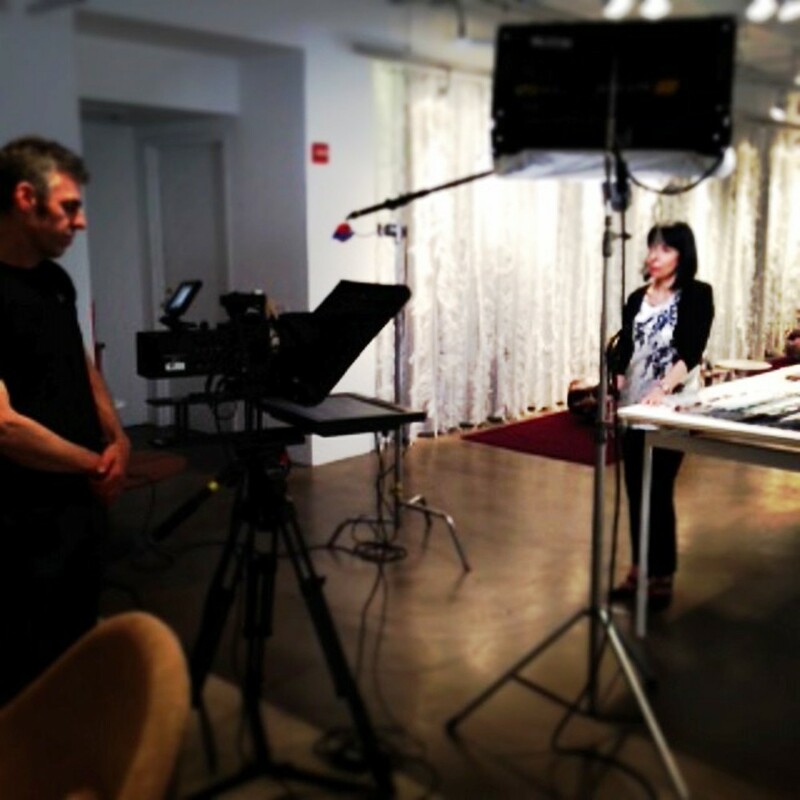 The culmination of years of research on the way people work today illustrates that Rockwell Unscripted is anything but unplanned. 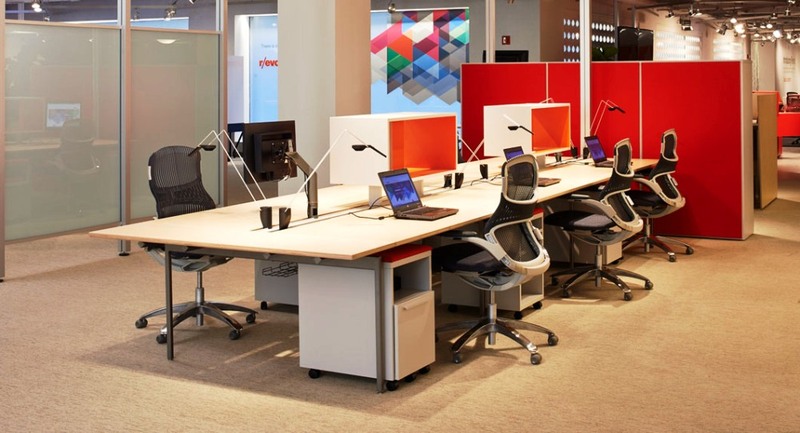 As mobility lifts limitations on where work is done, organizations are challenged to create engaging environments that draw workers to the office.